We are a Destination Management Company supplying meet and greets, transfers, fully escorted and group series tours, seat-in-vehicle tours, open-vehicle safaris and FIT services in South and Southern Africa. Established more than 36 years, we provide memorable and life changing African holiday experiences thereby ensuring your success in selling Africa. We have a proud history of more than 36 years all embracing, hands-on experience delivering quality and value ensuring great care and attention to detail, innovation, flexibility and a wide range of product service offerings. We operate from the three main cities Cape Town, Durban and Johannesburg and have an additional 12 receptive offices around the region including Kruger Park, Hluhluwe, Hazyview, Malalane, Mozambique, Port Elizabeth, Knysna, Victoria Falls/Zimbabwe, Zambia, Botswana, Namibia and Mauritius. All our offices offer a team of permanent Tour Guides, Drivers, Guest Service Officers and we run a well oiled Guided Journeys business. Our fleet comprises of 100 of our own vehicles ranging from sedans, to luxury two passenger limousines to luxury 44 seater coaches and sixty seater touring vehicles. We are part of Cullinan Holdings Ltd. and are also a member of the family company The Travel Corporation, renowned and trusted for its outstanding quality, service, value, reliability and financial stability. We are a proud member of the TreadRight Foundation, a non-profit foundation promoting sustainable tourism within our own family brands. At Thompsons Africa we are mindful of the plight of wildlife across the globe and in Africa in particular. We are especially conscious of the importance of conserving our wildlife heritage. After all, we are blessed to be the caretakers of an abundance of wildlife that brings so many travellers to our shores. Thompsons Africa does not support any wildlife interaction that we deem to be unethical in either its purpose or in any way results in cruelty as a side effect. As a priority we ensure that we are 100% involved with our partnered wildlife organisations, and as a member of The TreadRight Foundation, we practise the promise to make the welfare of our wildlife our number one concern. Life is all about journeys. One of the most unforgettable journeys you will ever take is into Africa, not only because of its unsurpassed beauty and wildlife, but because of the people who will welcome you warmly and who will enrich your enjoyment with their generosity and friendliness. 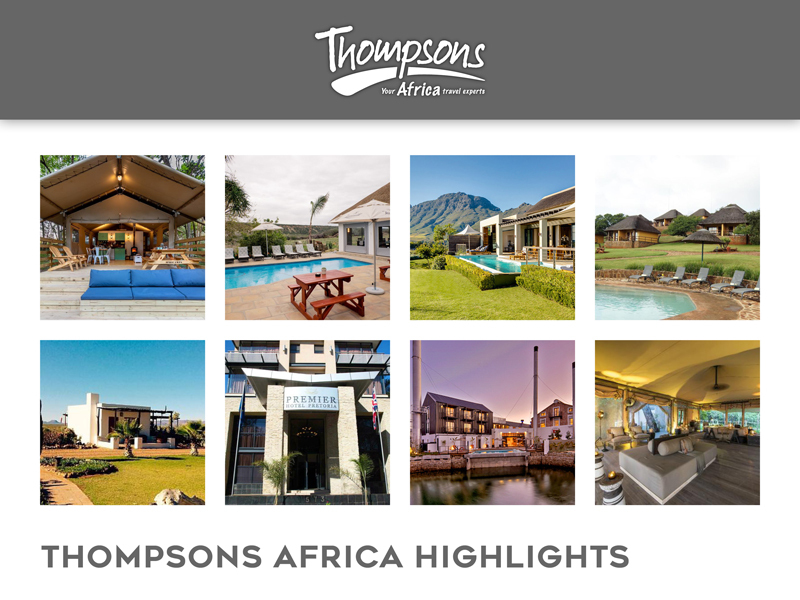 Unspoilt beaches, game reserves as big as European countries, soaring mountains, scorching deserts and rolling plains... Let Thompsons Africa take your guests on the journey of their lives.